The crowd at the first livestock health workshop at Belgenny Farm earlier this year attended by more than 30 landholders from our region. Greater Sydney Local Land Services records show Macarthur is home to almost 8,000 sheep, more than 11,100 beef cattle and almost 3,000 dairy cattle. At the end of another tough year thanks to one of the worst droughts in a long time, many of these local farmers are expected to embrace a free workshop on how to maximise sheep and cattle production. The free workshop will be held this Friday at Belgenny Farm, just a short drive out from the town centre. 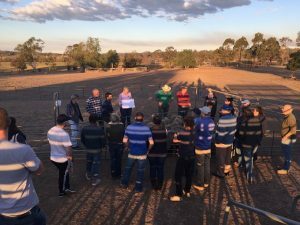 Coordinated by Greater Sydney Local Land Services, the event follows on from the raising livestock in Macarthur workshop earlier this year which attracted more than 30 landholders. “Farmers and livestock producers in the area will get expert insight into current seasonal conditions and opportunities to maximise their sheep and cattle production in the local area,” says district vet Lisa Goodchild. Ms Goodchild said there would also be update on current local market trends. 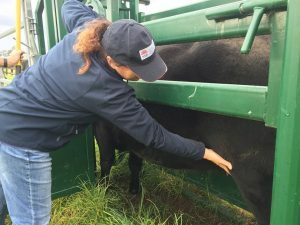 It has been a tough year for landholders in Macarthur, says district Vet Lisa Goodchild, pictured examining a cow for ticks. “It’s been a really tough year for landholders with the latest seasonal conditions showing the Macarthur region still battling intense drought and only one per cent of the entire Greater Sydney region declared drought free,” she said. “I’d encourage producers to come along and take advantage of the advice and resources available to them,” Ms Goodchild said. The workshop will be held this Friday, November 30 at Belgenny Farm, 100 Elizabeth Macarthur Avenue, from 4pm and includes a barbecue dinner. The event is part of the Australian Government’s Agricultural Competitiveness White Paper, a plan supporting stronger farmers and a stronger economy. Register via the following link.